Density is defined as “the number of individuals per unit area, per volume or per unit of habitat“. Density affect individuals in populations, for example trees in crowded stands may grow more slowly, and some may die due to lack of water, nutrients, light, etc. The density of organisms in one area varies with the seasons, weather conditions and food supply. Total counts may be possible for some plants and large or conspicuous animals such as birds and butterflies. The measure of the number of individuals per unit area is called crude density, and the density measured in terms of amount of area available as living space is ecological density. Distribution refers to how organisms are dispersed over space. Density affect how organisms are dispersed or distributed over space. Individuals of population may be distributed randomly, uniformly or in clumps. Random Distribution: Individuals are distributed randomly if the position of each is independent of the other. For example, trees of the same species in the canopy layer may be spaced at random. Uniform Distribution: Individuals distributed uniformly are more or less evenly spaced. For example, uniform distribution occurs among plants when severe competition exists for crown or root space, as among some forest trees. Dispersion patterns in a population is difficult and require careful sampling techniques. The age structure of a population is “the ratio of the various age classes to each other at a given time”. Age classes can be specific categories such as years or months, or life history, such as eggs, larvae, pupae and instars. 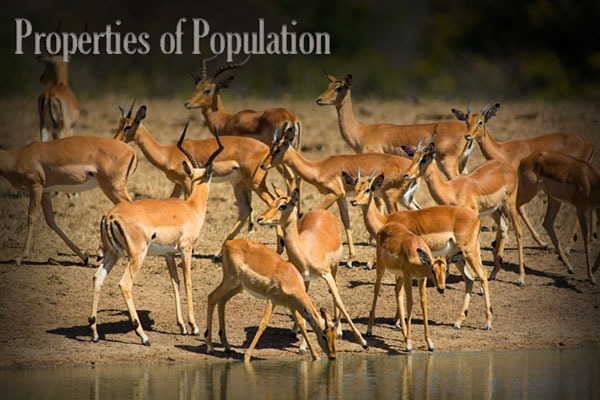 Individuals making up the population may be divided into three ecological periods: pre-reproductive, reproductive and post-reproductive. The distribution of individuals among age groups influence the birth rate (natality), death rate (mortality) and growth rate. A large number of young about to enter the reproductive age suggests a potentially increasing population whereas a high proportion of individuals in the post-reproductive age classes suggest zero growth or a declining population. Age distribution provides a valuable insight into the history of a population. Among plant species, age-class structure provides only a limited picture since the growth rates are indeterminate, i.e., not linked to age. Natality is the birth of new individuals. The number of births per female of age x per unit of time is called birth rate. Birth is the greatest influence on population increase. Like death, births are age-specific. Certain classes contribute more to the population than others. Natality in plants is complicated because they have both vegetative and’ sexual reproduction. Seed production and germination are true natality, because they produce new genetic individuals. Modular populations of clones – leaves, buds, and twigs exhibit their own “birth” rates. Mortality is; the death of individuals. The number of individuals dying during a give time period is called death rate or mortality rate. To calculate mortality, we divide the number of individual’s that died during an interval of time, by the number alive at the beginning of the period. Mortality is the probability of survival the number of survivors is more important to a population than the number dying. To obtain a clear and systematic picture of mortality and survival, we can construct a life table. The life is simply an account book of death. Life tables for animals can be derived from data on mortality and survivorship. Life table for plants are more difficult to develop because plants have modular growth and two life cycle stages, germination and seedling development. We derive mortality and survivorship curves from life tables. These are useful for comparing demographic trends within a population and among populations under different environmental conditions, and comparing survivorship among various species. In general, mortality curves assume a J shape. Survivorship curves fall into three major types: Type I, in which Individuals tend to live out their physiological life span; Type II, in which mortality, and thus survivorship. is constant through all ages: and Type III, in which survival of young is low. Survivorship curves follow similar patterns in both plants and animals. The rate at which a population change can be estimated from the net reproductive rate as determined from fecundity table. In an unlimited environment, populations expand geometrically or exponentially. Exponential growth, described by a J-shaped curve, is like compound interest. Such growth may occur when a population is introduced into an unfilled habitat. Natural populations rarely achieve a stable level. They fluctuate within upper and lower limits about a mean. The population continues to grow indefinitely Interactions among members of the population regulate the size of the population. The key interspecific interactions are: competition, predation, parasitism and mutualism; whilst the main intraspecific interactions are competition altruism and cannibalism.